As part of my due diligence, I like to review relevant information. I continued to trip over the same acronym, in various contexts. Think these webpages might cause issues? When this week kicked off, I had a job interview scheduled for this afternoon. This opportunity was a bit out of my comfort zone, but I truly was looking forward to it. I like challenges. Monday, phone call with the recruiter to go over a couple of items to help improve my success when meeting with these folks. Fortunately, the recruiter forwarded me the profile information for the individuals I was scheduled to meet. Tuesday, I was out and about taking care of things. The recruiter calls my home phone, not once, but twice in a four hour period. They were smart enough to email me as well, as I am not so good at answering the telephone unless we have scheduled something. Bottom line, they want to re-schedule the interview for next week. Fine, sure, whatever. I really am interested in doing this interview. We have re-scheduled. I think I might like this job. Now there’s a qualified statement for you. How am I supposed to know? I have not been forwarded an explicit job description from anyone – not the recruiter nor the client. The reason I want to do this interview is to be ‘there’. This is not a basic, back-office job with a major corporation doing business-as-usual production. They are new. They produce tangible products. They deal with mundane issues. They are exceeding and their growth curve is phenomenal! The bulk of my career has been in software-as-a-service products. I haven’t done serious erp in almost 20 years. Supply chain for me meant meeting QoS guidelines. It would be fun apply those principles to actual, physical products. To have the opportunity to participate in the creative process from beginning to end! Maybe what I need to do is continue developing the definition of what a scrum master does or could do within this company and share it with this particular recruiter? Completely, unrelated sidebar – WP could you fix this incredibly ridiculous scrollbar experience, please. So sad. I was talking to a recruiter about some of the work I had done in my recent past. I am very proud of the work we did over the last few years, so I have no problem bragging about what was accomplished. My issue is trying to communicate it to wireless outsiders. In an effort to show the types of tools we worked on, I suggested the recruiter take a look at magenta’s website and do a coverage check. EPIC FAIL TMO – screen shot below. So, so sad…..
Frontier Airlines – I am so disappointed! Fourteen years ago I had the displeasure of being stuck on a last minute flight serviced by Frontier Airlines. It was such a horrendous experience, I swore I would never fly on them again. Four years ago, I had no other choice but Frontier to be able to get someplace I needed to be, in a timely fashion. I was incredibly, pleasantly surprised. That trip experience caused me to revisit my earlier decision to exclude them from the options when planning a flight. Last year, Frontier began direct flights from where I live now to my hometown. I was thrilled beyond belief. No one flies directly to my hometown! My parents are aging and it was easy to be able to go to my airport and land practically at their front door. Frontier had proclaimed my hometown to be one of their ‘focus’ cities and I couldn’t be happier. The terminal is clean. The staff is friendly. We took advantage of these flights. It was a marvelous experience. In addition to actually flying where I wanted to go, Frontier had a tiered pricing strategy that allowed me to choose my experience and pay for what I wanted for my trip experience. Along with the other carriers, Frontier began charging for baggage, beverages, on-board entertainment, etc. Their differentiator had become the optional bundling prices. If you were solely interested in budget, you could choose their least expensive fare and fly on the cheap. If you were going to check anything, you could purchase the next level up and still not have all of the amenities. If you were like me and interested in minimizing the stress and strain of a trip by paying for the experience you desired when you traveled, you could go with their high-end priced ticket purchase. This simplified everything. You could check two bags, the cost was included. You could pre-select your premium seat, the cost was included. On-board entertainment was included so you didn’t have to fumble to locate your credit card if you desired to watch the television in the back of the seat in front of you during your trip. Automatically you received a beverage on-board while you were traveling between your destinations. For me, the less-headaches-make-for-a-pleasant-trip-traveler, this option was perfect. I liked paying for everything I wanted all at once. I liked knowing how much my trip was going to cost me before I left. I liked budgeting for the trip and knowing there wouldn’t be any surprises when I was aboard the plane. This set of options worked for me. The bookkeeping was simplified and the tracking was their problem. Earlier this year, Frontier announced it was eliminating its focus city program and pulling all flights to my hometown. I was horrendously disappointed, but understood the economics of their decision. I realized this is probably one of the concessions they had to make to stay in business in the cut throat competition that is commercial travel. No problem. There is an airport not that far to the north where I can still rent a car and drive to my parents’ house. The bummer is it will cost me more. The facility fee at this larger airport is substantially higher than that of my hometown, but this was a price I would have to pay whether I flew Frontier or any of the other airlines that service the larger hub airport. 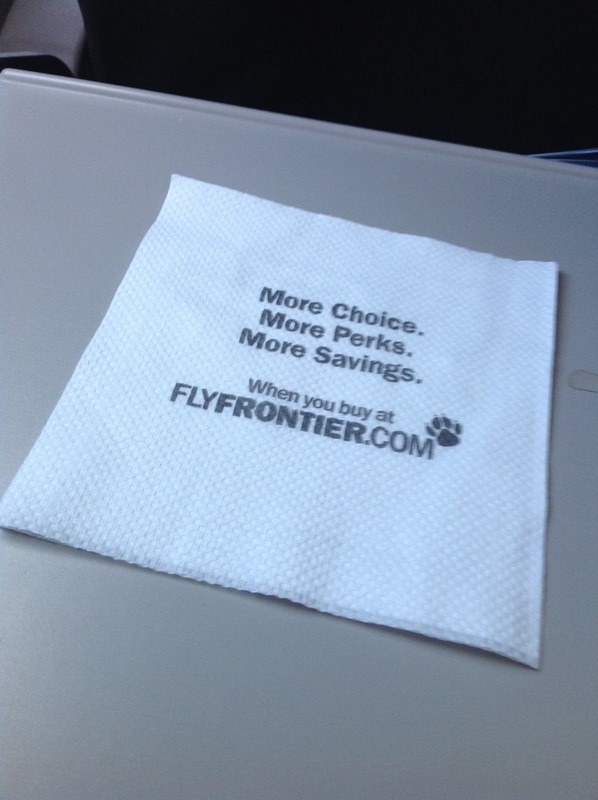 I bit the bullet and bought the Frontier ticket, anticipating all of the other amenities that had made my experience better than that of the other air providers to be worth the difference. July 10th, we set out on our holiday adventure to find our way to my hometown. The trip started amazingly well. The car I booked to get us to the airport wasn’t merely a towncar, they sent a stretch limo. The car service we use does this from time to time and I always get a chuckle out of watching the driver back the limo down a drive that isn’t much longer, or wider, than the car itself. The driver was amazing. He was friendly and entertaining. I like to have drivers with personality and this particular car service seems to hire those the best. Our experience at the airport was wonderful. We had paid for the premium tickets, which includes the ability to use the quicker lanes through security. Save for the family headed to Europe whose children were the most entitled people I have met in a long time, even the TSA adventure wasn’t awful. We are planners, so we had planned for delays in security but we didn’t hit any so we were able to find our way to a nice restaurant in the terminal and have a drink and a sandwich before we boarded the plane. • Changes to the product offering without any notice. • Plane was dirty. Incredibly dirty! 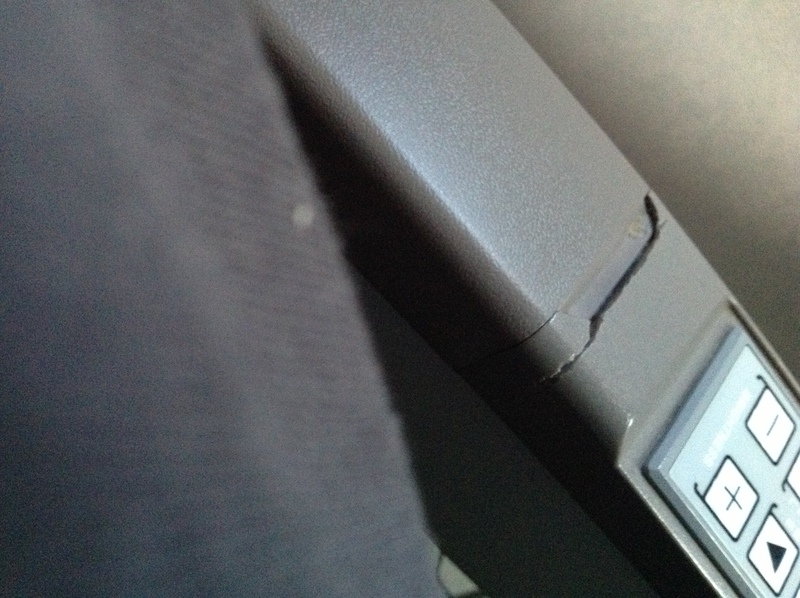 • Seat pocket was broken. • Staff on the plane seemed tired and somewhat rude. I had bruises on my arm and shoulder from where the seat banged on me every time we hit a bump on the ride. 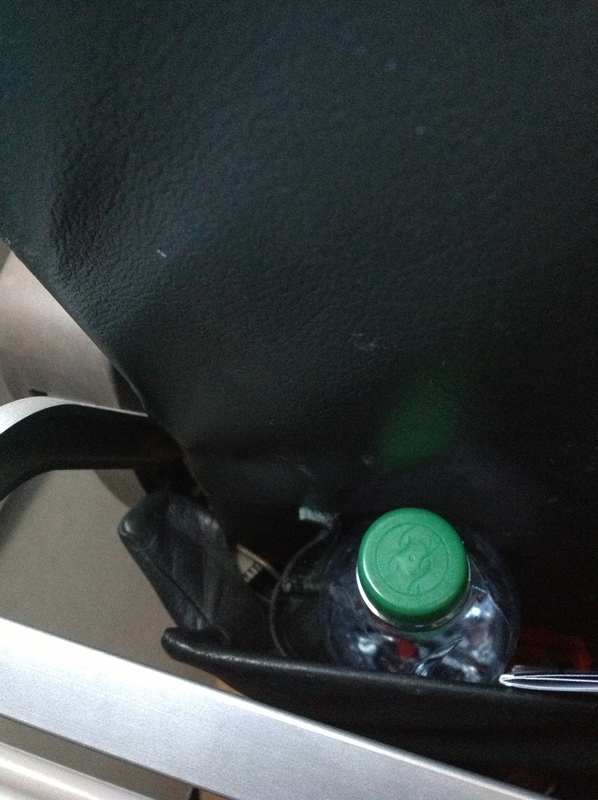 FWIW – that is NOT my bottle of water in the seat pocket in front of me, although that is where I should be able to store mine, if the plane had been clean. Since I traveled with them 6 months ago, they have lost all of the things that had impressed me….I guess I need to find a new airline, again. Time to do some research. There is always United. Alaska is entering the markets that Frontier has abandoned. Time to check out their schedules. I know United is going to treat me poorly, but at least their planes are clean and they don’t lie to you and change their offerings as quickly, without any notice. I don’t have as much experience with Alaska, but I do have a few friends who swear by, rather than at, their performance. Guess it is time to give them a chance. Increasingly companies are expressing their disinterest in brand loyalty. I am not a price only consumer, I look at the entire package and I do not feel like I received the value for what I paid to Frontier. I have to take back all of the glowing statement I made about Frontier a year ago. To everyone I misled into thinking you would have a positive experience, my apologies. Posted on July 21, 2013 May 10, 2014 Categories Customer Service, Customers, Themes, TravelTags Airline, Business, Denver International Airport, Frontier Airlines, travelLeave a comment on Frontier Airlines – I am so disappointed! So I tend to go on an on about customer service, it is important to me. No doubt about it we are going to need it at one point or another in our lives. Well, I ordered some hairspray. What can I say? There is a particular brand of hairspray that I really like, but it is hard to find, so I have to order it. Since I was placing an order anyway, I went ahead and order a couple of other items. Total items in the order 3. Well the order arrived today. The pick list said all 3 items were included in the package. Alas, only 2 of them were there. Of course, the item that didn’t make it into the package was the item that I really wanted. So I looked online to see if I could find an easy answer. No. I did find their customer service number and gave it a ring. Wow! Was I ever impressed. I didn’t have to hold forever. I was put through to the nicest customer service agent I have ever encountered. I was ready to argue for what was right. He was phenomenal! He asked me what the issue was and I explained how the order had arrived today sans the hairspray. He was great. Instead of pushing back and arguing with me, he was ever so kind and went out of his way to explain how these things can happen and immediately set me up to receive a replacement, no charge. No pushback. No discussion. Just pleasant customer service. A big shout out to Mike, wherever he may be. You have made me into a believer. I will shop from you again.